Learn the Tibialis Posterior Reconstruction for pes planus surgical technique with step by step instructions on OrthOracle. Our e-learning platform contains high resolution images and a certified CME of the Tibialis Posterior Reconstruction for pes planus surgical procedure. 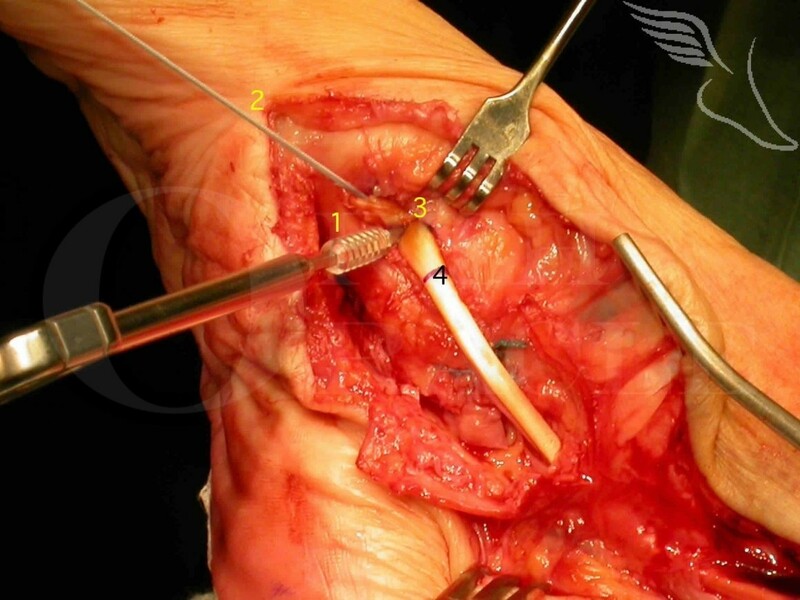 The operation described using a Flexor Digitorum Longus(FDL) transfer, spring ligament plication and medialising calcaneal osteotomy is the classic reconstruction for a grade 2 (flexible ) flat foot due to Tibialis Posterior dysfunction. Tibialis Posterior dysfunction is typically a condition of middle age and onwards in which conservative management with orthotics and physiotherapy is usually the first line of management and often successful (in approximately two thirds of cases). Surgical correction of the flexible flat foot using the FDL transfer with calcaneal osteotomy (and other procedures) results in high patient satisfaction rates and symptomatic relief but with a slightly lower incidence of maintained correction of the pes planus deformity. A proportion of patients, though improved, still require the use of a corrective orthotic.